There are two ways of looking at this situation - firstly, getting average scores is a reflection of many things. If somebody has successfully cleared 10th standard exams then he has at least average abstraction which means that he can score more if he works on his study habits. Effective management of time, learning according to one’s learning style and making study plans, and more importantly, proper execution of these study plans can help improve the scores. 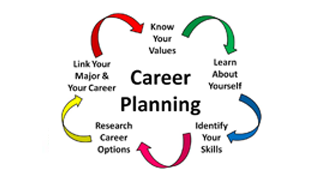 So while on the one hand, planning one's career through scoring a good percentage in school and college, as well as getting a degree from a well reputed institute is one end of the spectrum, and the direct path for scoring a good percentage is by working on one's study habits, however, there is yet another way to look at career planning. Like many of us you are getting average marks. Rather than getting disheartened, a reality check and a little Google search will lead you to a conclusion that all successful people were not all toppers. So keep heart and start thinking. There must be something that you do well, that you learn well, enjoy doing… it could be a favorite subject, or perhaps even a task that you do well that can be taken seriously to make it into a career. So the first task is to identify that strength and build on it. Another breather that you have is that admissions process has undergone change and from journalism to engineering, almost every course now has an entrance test. And for many courses, institutes have started taking Aptitude tests. For example: There is an architect aptitude test, design aptitude test, engineering aptitude test, and so on and so forth. By bringing in the concept of an aptitude test in the admission procedure, what these institutes are ensuring is that people who are actually good must have a good chance to get admitted. Another fact is that there are various alternative routes for reaching your career destination, provided you are clear about what your career destination actually is. For example: you want to be in Medical field and can’t get through MBBS entrance, you can do Ph D in a related subject and be associated with medical science or you can also become a veterinary doctor and work in the prevention of human diseases as many of them get transferred through animals. Or for example you want to do M Tech, and if you can’t get through engineering, you can do MSc and then go for M Tech. Similarly there are alternatives available in many careers and proper planning can help you a lot. One should take help of career counselors who can guide you towards the alternative path to be in your preferred career field. Another important thing is that after you secure admission, put your maximum efforts so that you can learn more and also improve your scores. Average scores in one or two exams does not mean that the scores will remain average in all the future exams. So work hard and take help of Aptitude tests to find out your strengths and of career counselors to suggest you back up/ alternate career paths.